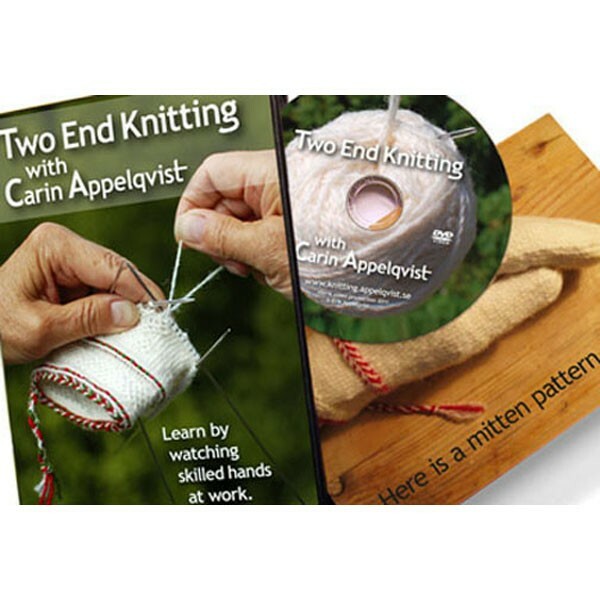 Two End Knitting with Carin Appelqvist is a charming and informative new DVD from Sweden. Carin is a master knitter who specializes in Two End Knitting (also called Tvåändsstickat, or Twined Knitting) and it is a pleasure to watch her skillful hands demonstrate the techniques - worked by knitting with the inside and the outside of the same ball of wool; or you can use 2 different colors, worked alternately. Instructions include: how to wind a center-pull ball; a number of different ways to cast on; how to knit, purl and a very clever increase, and how to form designs by working loops across the front (called 'Crook' stitches). You are also taught how to keep the wools under control as you work. Carin's voce is overdubbed in English. A wonderful augmentation to Anne-Maj Ling's splendid book, Two-End Knitting. 20 mins. DVD.